Welcome to the daily edition of GeekBytes for November 29, 2011. In today's instalment, we take a look at some interesting gadgets you can either buy or make yourself. Hint: could also be useful for a certain holiday coming up shortly! Don't forget: If you think another clever or quirky gadget is missing off the list, tell us in the comments or drop us an email. Work in a lab and want your goggles to stand out above the rest? 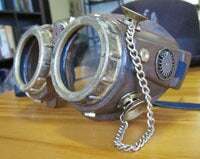 As Instructables member Carlton Designs suggests, simply give them a good lick of paint and turn them into Steampunk googles. Carlton Designs created its googles by taking a normal pair, painting them to mimic wood and metal textures, and adding a chain and various metal objects. And there you have it--classy, Victorian-era goggles. Want to make sure all your files are secure from being not only misplaced, but opened? A Kickstarter project has just the product to help. Crypteks USB is a USB stick that you can lock and unlock using a combination. The USB stick sits within a number of rings, which all hold part of a combination: Get the code correct, and the tiny stick can be freed from rings to be used as normal.